Seattle Creation Conference, August 2005. Dr. Faulkner examines the assumptions and historical development of modern cosmological ideas culminating in the current cosmology, the big bang model. We will then compare these ideas with those of Biblical creation and discuss some common misconceptions. This video file is a 60 minute seminar by Danny Faulkner that was recorded during the Seattle Creation Conference, August 2005. View more videos from the 2005 conference. Danny Faulkner is a creation scientist and educator specialized in Astronomy and Physics. For over 25 years he was on the faculty of the University of South Carolina Lancaster, where he taught physics and astronomy. He was Chair of its Division of Math, Science, Nursing, and Public Health (2009–2012). In 2012, Dr. Faulkner retired as a full professor and now holds the title of Distinguished Professor Emeritus. In January, 2013 he joined Answers in Genesis as a full time scientist and speaker. He has been extensively involved in creation science, serving on the board of directors of the Creation Research Society since 2005. 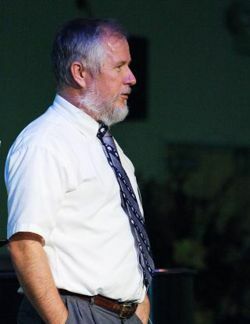 He is also a prolific author, having published a great many articles in secular astronomy journals as well as creationist publications wherein he presents the view of our solar system with all its planets and stars through a biblical perspective. Danny has also written a book on creation cosmology called Universe by Design, and been featured on two educational documentaries. Dr. Faulkner acquired his B.S. in math at Bob Jones University, Greenville, SC in 1976, and later obtained an M.S. in physics in 1979 at the Clemson University, Clemson, SC, and his M.A. in astronomy(1983) along with his PhD in astronomy(1989) at the Indiana University, Bloomington, IN. Danny's primary research interest is stellar astronomy wherein he has done significant studies on Binary Star systems. It may be viewed free online or downloaded to your computer as either a video or audio. A DVD can be purchased at our webstore as an individual title. The Seattle Creation Conference is a regular event organized by the Northwest Creation Network. For information about the upcoming conference visit the Seattle Creation Conference website, or contact the NWCN to have us organize the next creation conference at your Church.